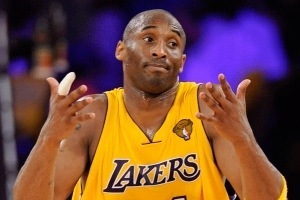 Home > Entertainment > Mom Sues Kobe Bryant! Kobe Bryant is putting the kibosh on his mother’s efforts to sell off his old stuff, including two 2000 Lakers championship rings designed for his parents. The “Bryant Collection,” which was expected to fetch $1.5 million for Pamela Bryant, who was planning on using the money to buy a house in Nevada, featured some of the basketball superstar’s high school jerseys and trophies. The auction was scheduled to go down in June with the help of Goldin Auctions, but the company was hit with a cease-and-desist letter from Kobe’s lawyer, citing that they did not “lawfully own” any of Kobe’s possessions. So now they’re suing Mamba. According to the lawsuit filed by company founder Ken Goldin, Kobe’s mom assured Ken that she was the rightful owner of her son’s middle and high school memorabilia that she kept in storage for over 15 years. Pamela claims that eight years ago she asked Kobe’s wife Vanessa if she wanted the items, but declined, stating “those items belong to the past.” The lawsuit also says Pamela has already received a consignment fee of $450,000, which she reportedly used to buy a house.